Many of us practise sustainable transportation options. We walk or bike to work. We take the bus. But sometimes those options just don’t work. We have errands to run all over town or we want to pick up a large load of groceries. We don’t want the expense of owning a car, but we would like the convenience of using one from time to time. Approximately five years ago, a steering committee with members from the University of Saskatchewan (Sustainability Education Research Institute, Centre for the Study of Co-operatives, The Spatial Initiative), We Are Many, and the City of Saskatoon decided to investigate the possibility of establishing a car share co-operative in Saskatoon. A feasibility study helped them to establish the fee structure and initial car locations. 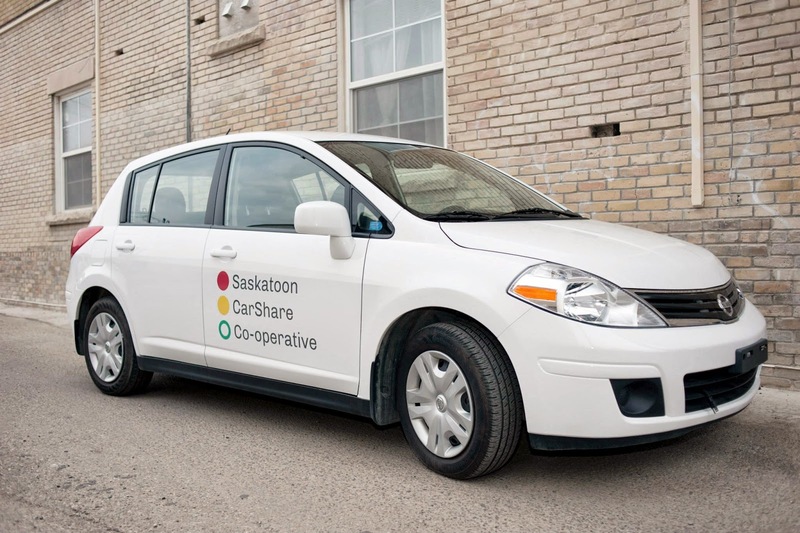 The Saskatoon CarShare Co-operative (SCC) was officially incorporated in 2012 and the first cars were purchased in February 2014. The cars are picked up and returned to set locations, so it’s important to choose the right neighbourhood, particularly when you’re starting up a brand new service. The Saskatoon CarShare Co-operative chose to place its first cars close to Broadway. One is parked on Broadway Avenue at Five Corners, while the other is located at Broadway and 8th. The City of Saskatoon provided dedicated parking spaces and signage. The SCC is considering expanding into other neighbourhoods in the future, but this won’t happen until they reach capacity with their current vehicles. Cars can be booked online and are available 24 hours a day, 7 days a week. You can book as far in advance as you want. The Co-operative currently has approximately 40 members so even last-minute bookings shouldn’t pose a problem. Other car share co-operatives have found that cars are used regularly but everyone still has easy access with 50-60 members per car, so the SCC still has room to grow. In purchasing their first vehicles, the Co-operative had to balance affordability and energy efficiency. They chose the 2011 Nissan Versa, a compact four-door car. In the future, the Co-operative may consider purchasing a six-person van to accommodate large loads or families with children. The carsharing arrangement works best for in-town travel or short out-of-town trips. If you’re planning an extended road trip, you’ll get better rates by renting a car. The SCC’s coordinator looks after day-to-day operations and works closely with members to make sure their needs are attended to. Casual: If you’re not sure that carsharing will work for you, you can test the waters by taking out a casual membership. You pay a monthly fee of $10 and an hourly rate of $8. Co-Op Member: Co-op members purchase a $500 refundable share. There is no monthly fee and the hourly rate is only $6. Family/Household: If more than one member of your household will be using the car, you can take out a Family/Household membership. The initial refundable share costs $750 with an hourly rate of $6. Corporate: Businesses can purchase a corporate membership ($750 refundable share, $6/hour). Employees can use the Co-operative’s cars for work-related trips. There is an initial application fee as well as an additional charge of $0.25 per kilometre with 5 free kilometres per trip. The cars’ onboard technology tracks time and mileage. Members submit a driver’s abstract in order to qualify for the Co-operative’s comprehensive insurance. Individuals with a recent record of at-fault accidents generally aren’t accepted. There is an optional damage pool of $5 a month to protect drivers against having to pay the full insurance deductible in the case of any partial or at-fault damage or accidents. How much money will I save by not owning a car? The cost* of owning a 2011 Nissan Versa is approximately $3,127 per year with an annual mileage of 800 kilometres. This includes fuel, registration and licence fees, insurance, maintenance, and depreciation. The comparable cost for a Co-op member would be $892 per year, although many SCC members drive less than that. The Co-operative is responsible for gas and maintenance. Members will only have to purchase gas if they go on an extended outing. A volunteer member monitors the vehicles once a day to make sure that they have gas and are clean. Board members take the cars to the car wash and for servicing. The cars’ onboard technology is a small but constant drain on the electrical system. This can be a problem in very cold weather, but volunteer members start the cars once a day in the winter and the vehicles are equipped with booster cables. 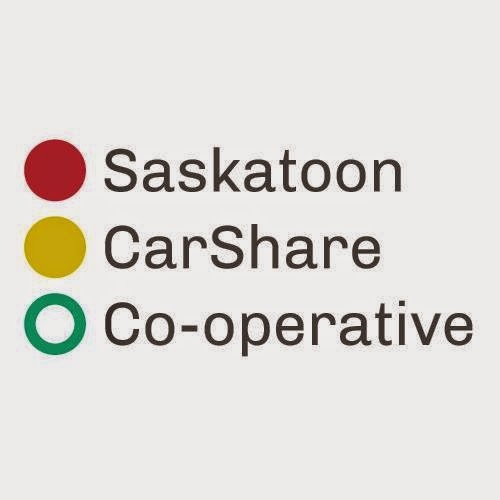 Additional information is available on the Saskatoon CarShare Co-operative’s website. You can also reach Jessie Best, the Co-operative’s Coordinator, at scc.coordinator@gmail.com. SCC is also on Facebook. * Costs were calculated using CAA’s Driving Cost Calculator.